Let's get started with Amazon Elastic Compute Cloud (Amazon EC2) by launching, connecting to, and using a Linux instance. An instance is a virtual server in the AWS cloud. With Amazon EC2, you can set up and configure the operating system and applications that run on your instance. When you sign up for AWS, you can get started with Amazon EC2 using the AWS Free Tier. If you created your AWS account less than 12 months ago, and have not already exceeded the free tier benefits for Amazon EC2, it will not cost you anything to complete this tutorial, because we help you select options that are within the free tier benefits. Otherwise, you'll incur the standard Amazon EC2 usage fees from the time that you launch the instance until you terminate the instance (which is the final task of this tutorial), even if it remains idle. The instance is an Amazon EBS-backed instance (meaning that the root volume is an EBS volume). You can either specify the Availability Zone in which your instance runs, or let Amazon EC2 select an Availability Zone for you. When you launch your instance, you secure it by specifying a key pair and security group. When you connect to your instance, you must specify the private key of the key pair that you specified when launching your instance. 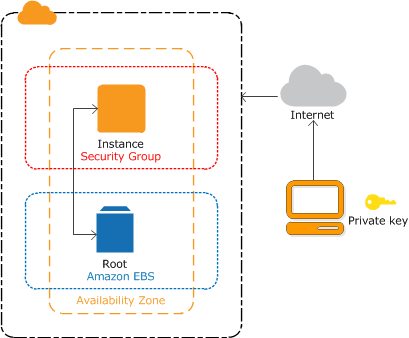 If you'd prefer to launch a Windows instance, see this tutorial in the Amazon EC2 User Guide for Windows Instances: Getting Started with Amazon EC2 Windows Instances. If you'd prefer to use the command line, see this tutorial in the AWS Command Line Interface User Guide: Using Amazon EC2 through the AWS CLI. Before you begin, be sure that you've completed the steps in Setting Up with Amazon EC2. You can launch a Linux instance using the AWS Management Console as described in the following procedure. This tutorial is intended to help you launch your first instance quickly, so it doesn't cover all possible options. For more information about the advanced options, see Launching an Instance. From the console dashboard, choose Launch Instance. The Choose an Amazon Machine Image (AMI) page displays a list of basic configurations, called Amazon Machine Images (AMIs), that serve as templates for your instance. Select an HVM version of Amazon Linux 2. Notice that these AMIs are marked "Free tier eligible." On the Choose an Instance Type page, you can select the hardware configuration of your instance. Select the t2.micro type, which is selected by default. Notice that this instance type is eligible for the free tier. Choose Review and Launch to let the wizard complete the other configuration settings for you. On the Configure Security Group page, ensure that Select an existing security group is selected. Select your security group from the list of existing security groups, and then choose Review and Launch. On the Review Instance Launch page, choose Launch. When prompted for a key pair, select Choose an existing key pair, then select the key pair that you created when getting set up. Alternatively, you can create a new key pair. Select Create a new key pair, enter a name for the key pair, and then choose Download Key Pair. This is the only chance for you to save the private key file, so be sure to download it. Save the private key file in a safe place. You'll need to provide the name of your key pair when you launch an instance and the corresponding private key each time you connect to the instance. Don't select the Proceed without a key pair option. If you launch your instance without a key pair, then you can't connect to it. When you are ready, select the acknowledgement check box, and then choose Launch Instances. A confirmation page lets you know that your instance is launching. Choose View Instances to close the confirmation page and return to the console. It can take a few minutes for the instance to be ready so that you can connect to it. Check that your instance has passed its status checks; you can view this information in the Status Checks column. There are several ways to connect to your Linux instance. For more information, see Connect to Your Linux Instance. You can't connect to your instance unless you launched it with a key pair for which you have the .pem file and you launched it with a security group that allows SSH access from your computer. If you can't connect to your instance, see Troubleshooting Connecting to Your Instance for assistance. After you've finished with the instance that you created for this tutorial, you should clean up by terminating the instance. If you want to do more with this instance before you clean up, see Next Steps. Terminating an instance effectively deletes it; you can't reconnect to an instance after you've terminated it. If you launched an instance that is not within the AWS Free Tier, you'll stop incurring charges for that instance as soon as the instance status changes to shutting down or terminated. If you'd like to keep your instance for later, but not incur charges, you can stop the instance now and then start it again later. For more information, see Stopping Instances. In the navigation pane, choose Instances. In the list of instances, select the instance. Choose Actions, Instance State, Terminate. Choose Yes, Terminate when prompted for confirmation. Amazon EC2 shuts down and terminates your instance. After your instance is terminated, it remains visible on the console for a short while, and then the entry is deleted. Learn how to remotely manage your EC2 instance using Run Command. For more information, see Tutorial: Remotely Manage Your Amazon EC2 Instances and Systems Manager Remote Management (Run Command). Configure a CloudWatch alarm to notify you if your usage exceeds the Free Tier. For more information, see Create a Billing Alarm in the AWS Billing and Cost Management User Guide. Add an EBS volume. For more information, see Creating an Amazon EBS Volume and Attaching an Amazon EBS Volume to an Instance. Install the LAMP stack. For more information, see Tutorial: Install a LAMP Web Server on Amazon Linux 2.